What is the Better Path to Take? Which is more important "sur meira," turn away from evil; or "asei tov", perform good deeds.? On which idea should greater focus be placed? Can one perform mitzvos if he has not yet eradicated the evil within him? Should one wait to perform mitzvos until after he has purged himself of all evil? According to Rav Zeev Weinberger (shlita), Menashe and Efraim symbolize these two distinct concepts. Menashe's name emphasizes total elimination of past evil, while Efraim's name alludes to focusing on constructive future activity, particularly mitzvos. Yosef and Yaakov differed regarding the relative significance of these concepts. Yaakov sought to bless Efraim prior to Menashe, an action which Yosef could not understand. He felt that we must first expunge evil before we can proceed to perform good deeds. Yaakov's experience in life taught him to be flexible. One cannot totally rid oneself of all evil without developing the capacity to "do good." In their classic dispute regarding the neiros, lights of Chanukah, Bais Shammai and Bais Hillel also debate this issue. The light of the candle creates two forces: the power to burn; and the power to give off light. The Chashmonaim triumphed over the Greeks, destroying their evil. They came to the Bais Hamikdash to purify it of its tumah, spiritual contamination. They lit a jar of untainted oil, which they discovered. This oil miraculously lasted for eight days. 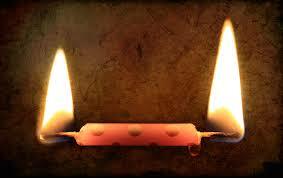 We can view the light/fire of Chanukah from two perspectives. It is a flame that burns and destroys evil. This is symbolized by Bais Shammai's approach, pocheis v'holeich, decreasing in number each night. According to Bais Shammai, on the first night we should light eight candles. On each subsequent night, we should subtract one light, signifying the destruction of evil. Bais Hillel, on the other hand, holds that one must first be kum v'asai, take a positive approach, purifying oneself through serving the Almighty and performing His mitzvos. This avodah, service, will succeed in eradicating evil, according to Bais Hillel. Thus, they contend that one should be moseif v'holech, increase a candle each night, starting with one candle and adding an additional candle each night as the force of purity becomes stronger and brighter.